Several recent diplomatic statements and media releases have thrown light upon the wave of militarism sweeping the Asia-Pacific region. The militarism has not been planned for defensive positions. It is aggressive and based upon real-war scenarios. 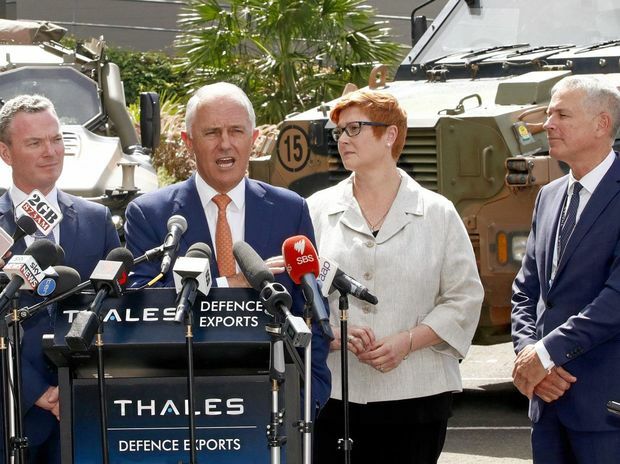 At the beginning of the year the Turnbull government in Canberra announced it was boosting military spending to two per cent of GDP together with a 'defence export strategy' aimed at adding 'another strategic economic path for Australian defence contractors'. (1) The announcement coincided with a further statement that the government intended to catapult Australia into the top ten arms exporters. At present the country is ranked at twentieth. The government report also threw considerable light upon US military planning and the designated role for Australia as a regional hub for 'US interests' with the statement the 'strategy paper states it wants to grow exports' to south-east Asia, India and the Pacific. (7) The plan is to clearly enhance Australian and 5-eyes influence across the wider region. Recent Australian media releases have included open support for the US position written by Defence Secretary Jim Mattis entitled the 2018 National Defence Strategy which has named Russia and China as the greatest threat to US security. (15) Fears exist inside the Pentagon the combined military power of both Russia and China is equal to that of the US. 1. $3.8 bn bid to drive arms sales, Australian, 29 January 2018. 2. Australia bids, The New Daily, 29 January 2018. 5. Our defence strategy: all the way with the USA, The Weekend Australian, 27-28 January 2018. 6. Abdication of responsibility in the neighbourhood, Australian, 31 January 2018. 7. Australia bids, op.cit., 29 January 2018. 8. Editorial, Momentous global change needs strategic responses, Australian, 29 January 2018. 9. Quad dialogue is our passage to India, Australian, 25 January 2018. 10. Ibid., and, US backs Joko bid for naval power, Australian, 24 January 2018. 11. US backs Joko naval bid for power, ibid., 24 January 2018; and, Defence Secretary meets Indonesian counterpart, Website: US Defence Department, 24 January 2018. 12. Let's strive for a key role in the emerging Indian miracle, The Weekend Australian, 27-28 January 2018. 13. Trump trade pivot stuns TPP nations, The Weekend Australian, 27-28 January 2018. 15. The Weekend Australian, op.cit., 27-28 January 2018. 16. US makes ready for war with old foes, Australian, 2 February 2018. 17. Swedes taught how to prepare for war, Australian, 19 January 2018. NATO Secret Armies, Daniele Ganser, (London, 2004). 19. US makes ready for war with old foes, op.cit., 2 February 2018.